In a previous article, the myth that Aurelius Buckingham named the Sunset District in 1887 was dispelled. Research has uncovered evidence that it was somebody else who first used the term "Sunset" in reference to the neighborhood. This is that story. Easton definitely deserves credit for being the first to associate a sunset with the Sunset, but Sunset Heights still is not Sunset. Nevertheless, the phrase was almost immediately adopted by other real estate firms to designate widely separated areas in the yet-to-be named Sunset District. In October 1886, 30 full blocks and 16 fractional blocks south of Golden Gate Park known as the Richardson Tract were sold for prices ranging from $625 to $1,450 per block. A week later the Berton Tract, comprising 11 blocks, was sold with the highest price for a block at $1,800. 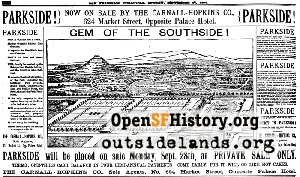 2 This immediately directed the attention of developers and speculators to what had only been referred to as the "Outside Lands". A year later, blocks had increased ten-fold in value, and the area had a name: "South Side" --- as in south of Golden Gate Park. In the summer of 1887, the South Side Improvement Club was formed, with Wendell Easton as president. 3 Made up of wealthy absentee real estate developers, promoters, and speculators, the interests of this organization were large-scale infrastructure projects that they believed would spur the development of their extensive South Side holdings. At that time there were only a few scattered families in the area. 4 By attracting more people to the South Side, these investors naturally expected to sell land and enhance their wealth. At the first meeting of the improvement club, what to name the neighborhood was brought up, but it wasn't considered important at the time and was deferred to a later meeting. Four weeks later, the South Side Improvement Club met again and once again the question of naming the district came up. There were many objections to "South Side" because it signified nothing. No consensus was reached at the meeting, so it was decided to let the public decide by submitting suggestions to the press, and to choose an appropriate name at a later meeting. 5 Nothing ever came of this plan. Four years after the formation of the South Side Improvement Club, a ground-breaking ceremony was held at Page and Clayton Streets for the extension of the Metropolitan Railway into the Sunset Heights/South Side area. 6 Wendell Easton was president of the Metropolitan Railway, which was a subsidiary of the Southern Pacific Company. 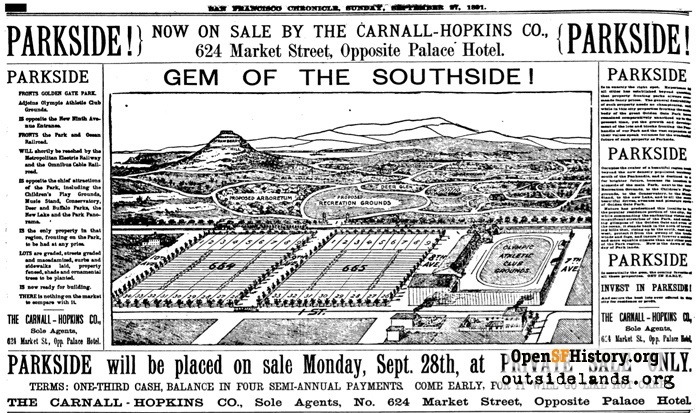 During this time Golden Gate Park, the South Side's main attraction, was undergoing significant development, which would have implications for the adjoining neighborhood. The 9th Avenue park entrance was completed, making 9th the most important street in the district. Stow Lake and a waterfall cascading down Strawberry Hill were under construction. In August 1893, 60,000 people attended the groundbreaking ceremony in the park for the Mid-Winter Exposition. In May 1894, the confrontation between Adolph Sutro and the Southern Pacific Company and its subsidiaries over streetcar fares erupted. Sutro's battle against the megalithic Southern Pacific Company led to a populist uprising, resulting in Sutro's election as Mayor by an overwhelming majority in November. But Sutro's election didn't end the war. It simply shifted the front from north of the park to South of the Park. In May 1895, the Regents of the University of California were seeking a site for the Affiliated Colleges, a campus made up of the professional schools of medicine, dentistry, pharmacy, veterinary medicine, and law. Sutro offered 13 acres of his land on the northern slopes of Mount Parnassus on the outskirts of the South Side. The residents promptly protested this mistreatment and demanded the restoration of a vital community necessity. But the representatives of the Market Street Railway, operator of the Metropolitan Line, were unsympathetic and unresponsive. Consequently, a grass roots organization arose consisting of the people who lived and worked in the area, owned small businesses and homes, and/or were raising their families and trying to make ends meet in the neighborhood abandoned by the Market Street Railway. The rest is history. On September 1, 1895, Sunset, in reference to the Sunset District, appeared in print for the first time. 16 Sunset Heights disappeared for almost 30 years until it returned to describe the heights east of 19th Avenue. South Side was immediately taken up by a neighborhood organization south of Market Street. Parkside resurfaced ten years later to describe the portion of the Sunset District south of Ortega Street. The Park View Hotel, in which La Grande Hall was located, was demolished in the mid-1920s. For many decades afterward, the site was a gas station. Over the next century, trees and buildings obliterated the sight lines that once allowed Gus Fox and the other residents of the Sunset to witness actual sunsets from 9th Avenue and H Street. Today the Canvas Cafe/Gallery occupies the site where Gus Fox and others met that summer evening in 1895 when the Sunset District was named. 1. San Francisco Alta, February 28, 1889, page 3. 2. San Francisco Chronicle, October 25, 1886, page 1. 4. According to the 1890 SAN FRANCISCO GREAT REGISTER OF VOTERS, there were 59,712 registered voters. Fifty-seven lived in today's Sunset/Parkside area. Keep in mind that voters were male citizens over 21 years of age. 5. San Francisco Chronicle, September 29, 1887, page 7. 6. San Francisco Bulletin, June 12, 1891, page 1. 7. San Francisco Chronicle, September 27, 1891, page 6. 8. San Francisco Chronicle, September 25, 1891, page 5. 9. San Francisco Chronicle, August 31, 1892, page 7. 10. San Francisco Chronicle, October 22, 1893, page 9. 11. San Francisco Chronicle, November 23, 1893, page 9. 12. San Francisco Chronicle, December 8, 1893, page 2. 13. San Francisco Chronicle, August 11, 1895, page 6. 14. San Francisco Call, August 14, 1895, page 14. 15. San Francisco Chronicle, April 25, 1925, page 9T. 16. San Francisco Call, September 1, 1895, page 12.